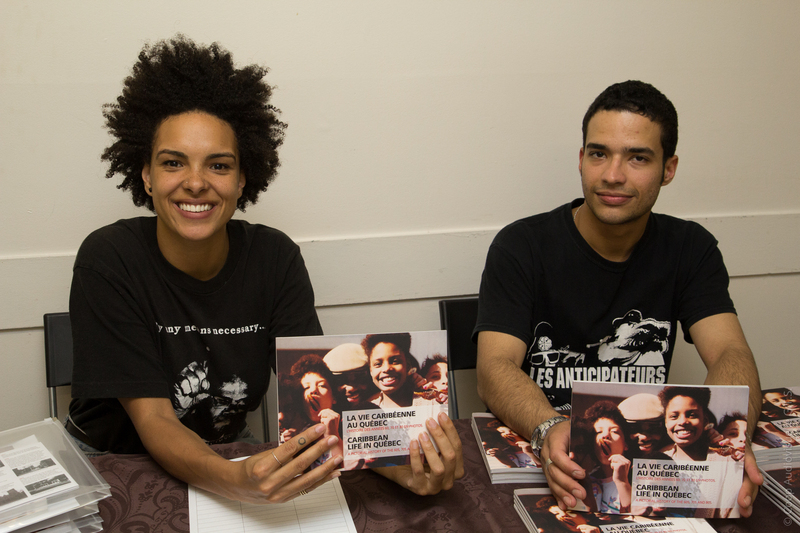 The Community launch of the booklet and the educational kit was held on June 23 2014, at Desta Black Youth Network, a youth organization in Little Burgundy. The pedagogical kit consists of the timeline, the booklet and the activity guide and is intended for community centers. Several community workers, teachers, academics, researchers, artists and young people and adults interested in the project attended this intergenerational event. The evening was a great opportunity for many to establish contacts and to learn more about the achievements of the project and the various collaborators who participated in it. Artists Neil Guilding AKA Zibz BlackCurrent (Coordinator, J2K NDG), native of St. Vincent and Elena Stoodley, native of Haiti (Coordinator MobileBiblio/QPIRG Concordia Library), participated in the event by performing texts and poems recounting the Caribbean experience in Quebec. Elena read a text by Haitian writer Rafaëlle Roy. Frances Waithe, Director of DESTA, introduced the youth organization and the great work they do in Little Burgundy. The event was truly an intergenerational one!